It is said that Crete’s greatest treasure is to be found in its cuisine. But what are the secret ingredients of this world-famous culinary tradition? The Cretan dietary archetype is known today all across the world. Scores of medical studies have found it to be of significant benefit to human health, while dishes inspired by the island’s traditional cuisine are served in many cosmopolitan restaurants in big European and American cities. And yet, it seems that contemporary Cretans took some time to discover it for themselves. It was associated with the frugality of agricultural life, and even with the privations that accompanied Cretan society for many centuries, and were due, primarily, to the complex paths of history, to wars and to the consecutive conquests by foreign powers. Strange as it may seem, Cretan cuisine only began to be talked about seriously in the early 1990s – when the results of the medical studies started to become available and more widely known. Preparing the traditional "xinochondros", a slightly sour type of pasta made from fermented milk and cracked wheat grains. Today’s 60-year-olds grew up eating plenty of greens and vegetables, a lot of pulses and very little meat (only every Sunday and on major holidays). This was how the island’s diet was described by the American researchers at the Rockefeller Foundation, who compiled a ground-breaking study on the island’s society and economy shortly after World War II. This was followed by the seminal Seven Countries Study, the brainchild of another American, Professor Ancel Keys. To a great extent, the Cretan diet owes its international fame to him. The island’s inhabitants had to rely on their land for almost the totality of their alimentary products, and their food did not come in great abundance – yet they lacked nothing. They were the healthiest of all the population groups in the study. Cardiovascular diseases were almost unknown, cancer was even more scarce; the island’s local population consisted in its majority of poor farmers, yet they lived their days happily in a beautiful natural environment; they worked their fields, enjoyed the most delicious fruit, as well as one or two small glasses of wine with every meal. Several more recent studies, as well as the statistical data provided by international organizations, have confirmed Keys’ findings. It is worth, however, focusing on the original study, which began in the early 1960s. Specialist researchers studied population groups from two Greek regions, Crete and Corfu, as well as from six other countries: Yugoslavia, Italy, Holland, Finland, Japan and the United States. The age of the people selected ranged from 40 to 60 years old. Approximately 30 years later, in 1990, all (or almost all) of the participants from the other groups had passed away. In Crete, more than half were still alive. In 2004, 154 people from the 620 in the original group were still living. This data comes from the Medical School of the University of Crete, which in 1990 took over the observation of these people. Newer data has not been published. Who knows, some could be perhaps centenarians, and still with us. Cretans sometimes get upset if someone today speaks to them about the “Mediterranean” diet. Academics, researchers and local community representatives believe that the term is too generic and does not accurately express the important distinctive features of their island. Only one term is acceptable here: the Cretan diet. They do, of course, acknowledge that every Mediterranean country has developed its own distinctive diet with several shared elements between them; the differences, however, are not negligible. A particular people’s diet is not only the result of what is produced locally. It is also shaped by the socioeconomic conditions, the cultural idiosyncrasies, the microclimate, the historical background and, also, in a significant way, the religion. In Crete, those who follow the Orthodox way of life do not consume foods derived from animals for more than a third of the year! 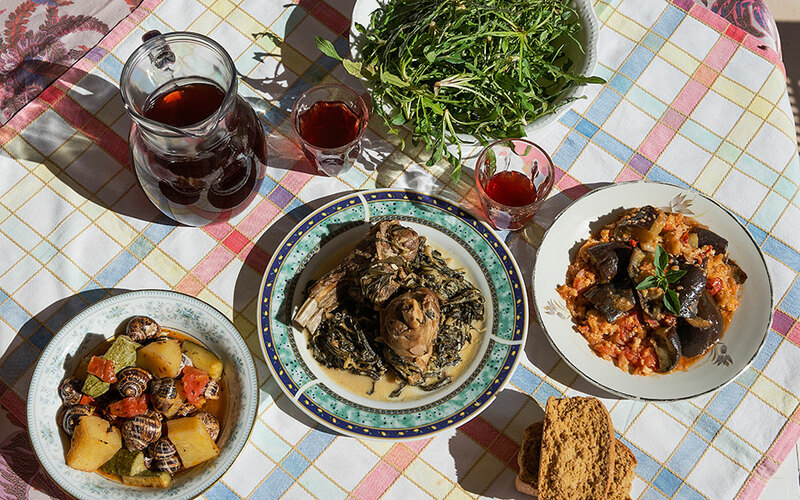 The term “Mediterranean diet” is perhaps a concept and a construct devised by scientists, yet it essentially describes the Cretan way of life in the 1960s. 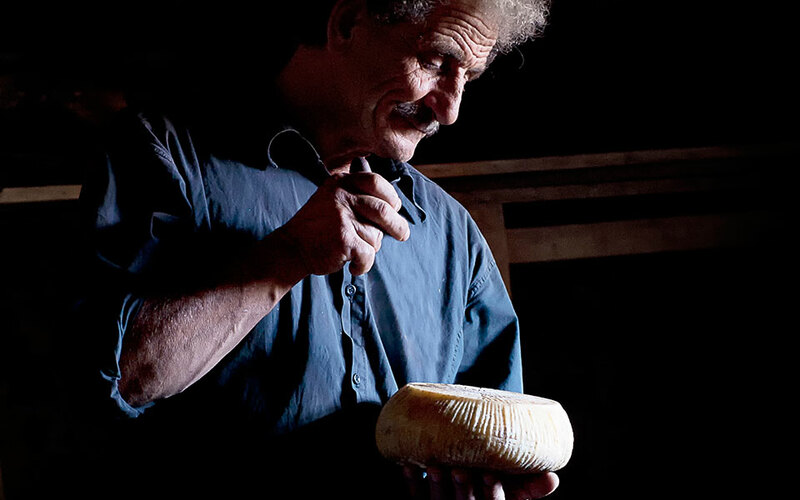 Cretan herdsmen still practise the ancient art of cheesemaking. Many ask what the much-talked-about Cretan dietary prototype really is. The answer is simple: it is the diet of the island’s poorer farmers, of the people who lived mostly in the countryside until the late 1970s. At that point, they began to be influenced by the modern way of life, to consume more and more meat, to use processed foods and more sugar in their cooking. One might well ask how such a notable culinary tradition could have evolved in a place where the diet of those who lived there depended almost exclusively on the local agricultural production. The underlying principle behind this entire culture, behind the techniques and the different ways of food preparation, is necessity: different flavors – that is to say different dishes – had to be created from the same ingredients. Wild greens at lunchtime and wild greens in the evening, and yet on the Cretan family table there was always a real wealth, a feast of aromas and tastes. 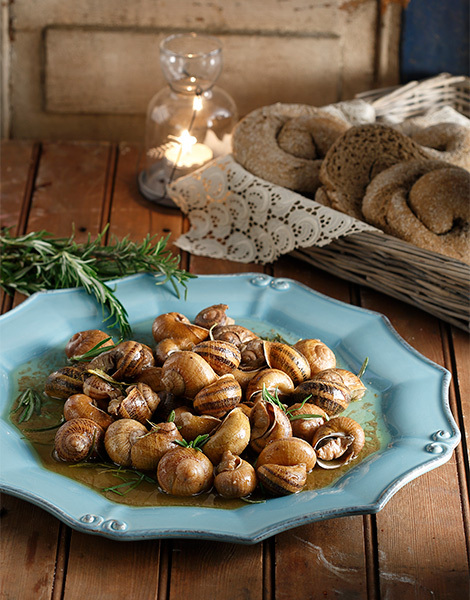 In our book, Traditional Cretan Cooking, we record more than 40 ways of cooking snails; snails are to be found in great abundance on the island, and have always constituted a favorite food for locals. 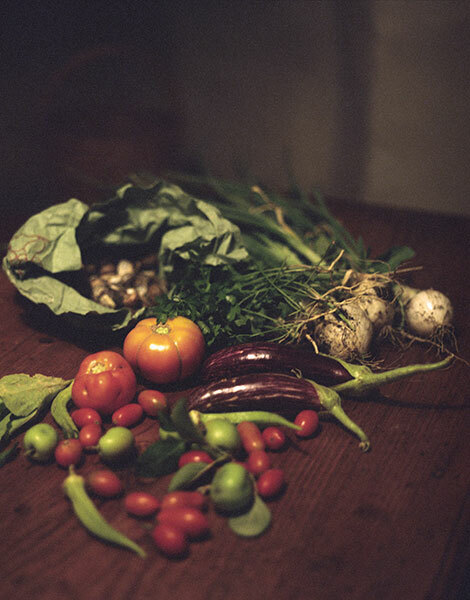 There are dozens of culinary processes for wild greens, for vegetables and pulses, devised to make the most of all the different aromas nature could offer. The famous Cretan wild green pies, for example, are prepared using multiple combinations of wild greens (self-seeded and non-cultivated) depending on the season and the local flora, so that the aromas can emerge naturally. If one were to ask a local woman how many different types of wild greens she needs to make a pie, she would probably laugh. As many as nature can provide. Yet, not all will do. Those that have a powerful scent will be used in moderation, and those that have a bitter taste will never be used in a pie, where sweet, mild-tasting wild greens dominate; it is from these that the harmony of a simple, yet ever so important and prized dish will emerge. And just so there may be no misunderstanding: bitter tasting wild greens are highly sought after in Crete – but for different dishes. Cretans have more than 40 ways of cooking snails. 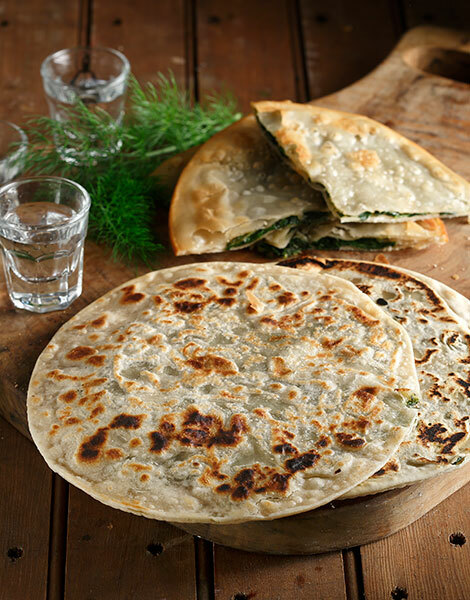 Xortopita, wild green pies, are prepared using multiple combinations of wild greens. Wild greens constitute perhaps the greatest capital of Cretan cuisine. No one knows exactly how many different species of plants are used for human consumption. More than 120 have been identified and counted. And they grow everywhere, from the coastal zones to the higher mountain regions. 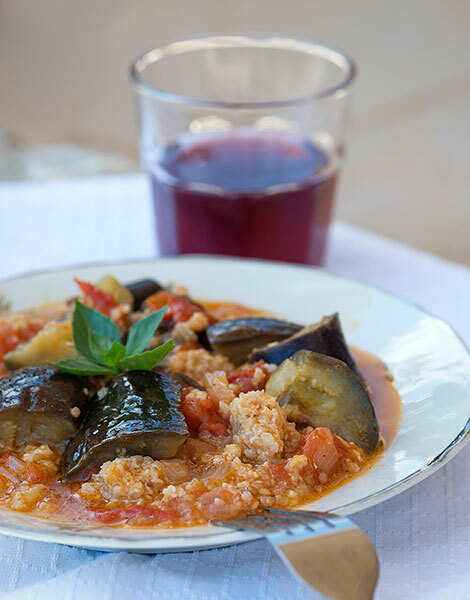 One of the great advantages of Cretan cuisine is its simplicity, the purity of its flavors. Spices and aromatics are used very sparingly, heavy milk creams almost never, so that each ingredient can maintain its distinctiveness. The most common ways of preparing meat and fish on the island offer a prime example of how to make the best use of natural resources. They are often combined with wild greens or pulses. 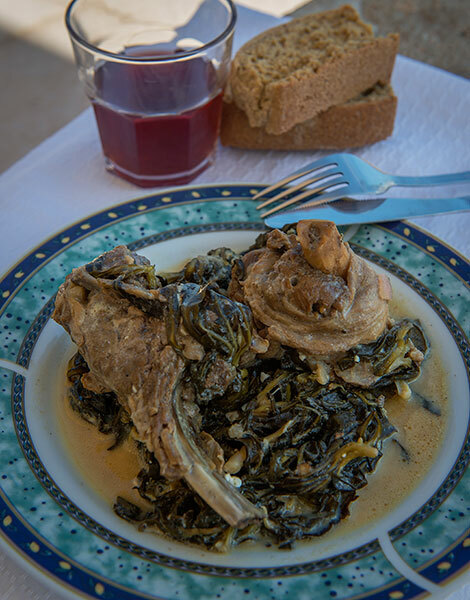 Even the traditional Easter dish of the Cretans used to be lamb or kid goat together with artichokes, or sometimes with lettuce, with chicory or other spring greens. It must, however, be noted that beef is very rarely used. 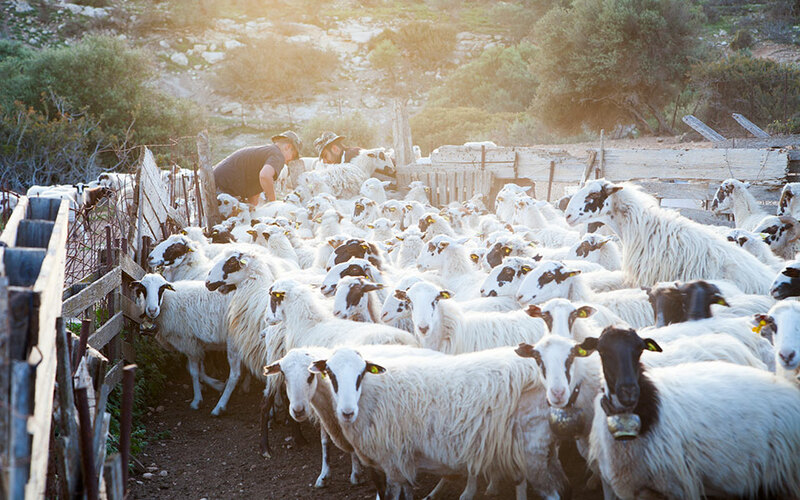 In Crete, they mainly use ovine and caprine animals (which still graze freely on the island’s mountains), poultry, rabbits and pork (the latter mainly at Christmas). If one of the great secrets of Cretan gastronomy lies in the harmony of the produce used, the simplicity of the finest dishes and the ingenuity of the local people, the other great secret goes by the name of virgin olive oil: no other cooking fat is used in the traditional diet of the Cretans. Even their desserts are most often prepared with olive oil, and very rarely with butter. What’s more, the entire island is effectively a vast olive grove, with 30-40 million trees. According to official international statistical data, each Cretan consumes more than 35 liters of olive oil annually – more than any other population group. In Italy and Spain, the predominant olive oil-producing countries of the Mediterranean, the average is just 10.5 liters! For visitors today, the exploration of the island’s local cuisine is an additional journey of discovery and a significant culinary experience. Unfortunately, it is not always readily available, and one needs to search in order to discover the island’s authentic flavors. There are certified restaurants that make a dedicated effort, yet even these are not enough. In most cases, the dishes prepared only draw their inspiration from traditional cooking. Thankfully, the drive to make the best use of the local gastronomy has been making major strides over the past few years. Several small hotels, small tavernas, restaurants and even cafés have become leading examples for others to follow. 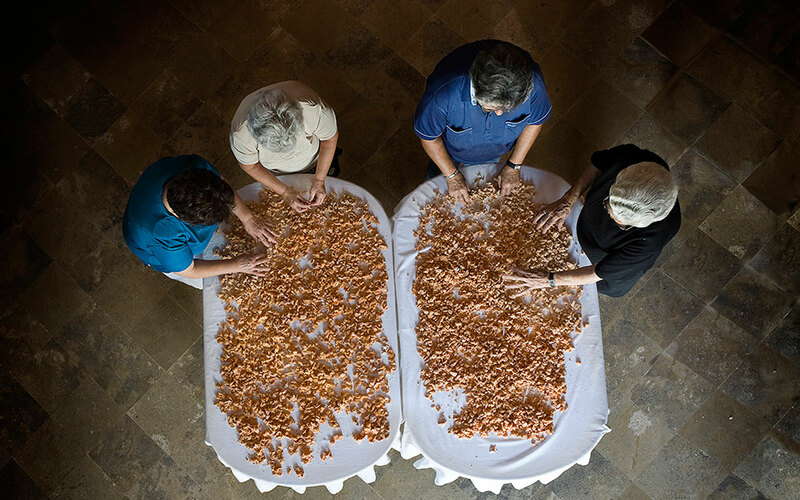 An important role is also played by a number of local cultural associations, which since the mid-1990s have been organizing yearly festivals, mostly in the summer, in some of the villages. At these festivals, the women of each village cook together and offer tastings of the local dishes. The quantities, however, are far too low to satisfy the ever-increasing demand. More than 120 edible plants have been recorded in Crete. 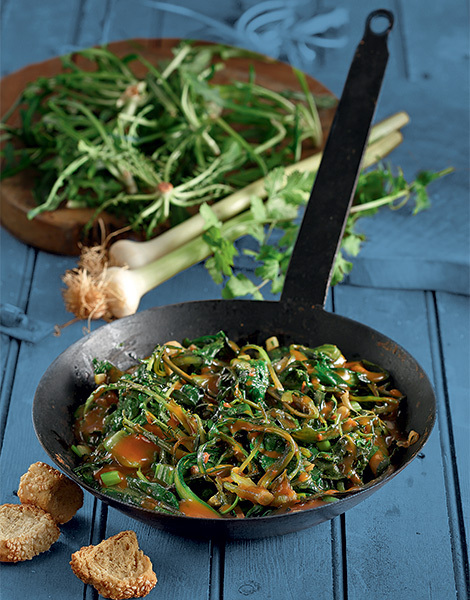 Wild greens with meat is another local classic. There is a saying among neighboring lands: if you possess a fine field, make sure to keep both cows and… Cretans at bay. I feel that it expresses well the philosophy that evolved on the island regarding dietary habits. The experience gained over many centuries led to an interesting culinary tradition that made the most of the resources of the land. Because, when all is said and done, the traditional diet of the Cretans is their true wealth – material and immaterial. Material since it has to do with food; immaterial since it carries the weight of a long historical trajectory, the experiences of the human journey. One London restaurant’s journey towards becoming a culinary destination.